This is it; this is what matters, the experience of a new product and how it makes someone feel. The Orphek DIF 100 V5 deserves to be the number one leader in aquarium LED pendants. If we are busy making everything, how can we perfect anything? We spend a lot of time on a few great products until every idea we touch enhances all aquatic life it touches. You may rarely look at it but you will always feel it. This is our signature, and it means everything to us. 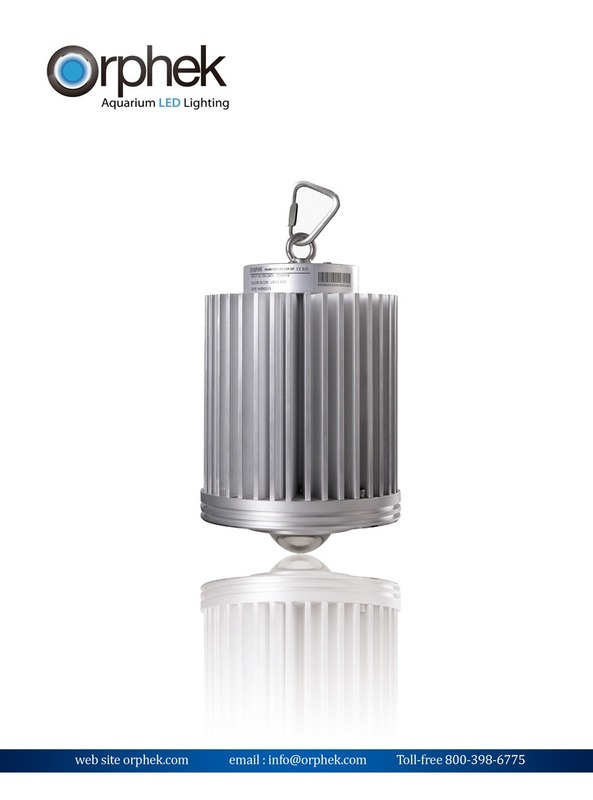 Orphek is pleased to announce the release of their new and much improved DIF 100 LED Pendant, the DIF 100 Version 5. The major physical changes are a new V5 matrix multichip, swivel ball locking type mount which allows the DIF 100 to be aimed in any direction required, and a lighter and smaller body. It can be wall mounted or mounted or to a hanging track or cable. The entire housing is made of lightweight aluminum which is impervious to the salt water environment. The hanging hardware is constructed of stainless steel. The DIF 100 V5 is smaller than the original DIF 100 and weighs less. Version 5 reduces heat by 15C and is now equipped with a quick release connector that allows a quick change of the new Orphek multi-chip LED should it become necessary, or if one wishes to change the chip to a different Kelvin temperature. The new version 5 also has increased protection from water by using high grade silicone seals. The renowned state of the art Mean Well LED driver is now remotely located and is connected by a quick disconnect waterproof connector. The lens is of high grade optical quality and larger in size, to provide a greater dispersion of light. Version 5 will offer four different lenses that can tailor the DIF 100 for any application, including very deep aquariums, coral display tanks, or coral frag tanks depending on the lens choice. The DIF 100 V5 will provide more PAR per watt than any other pendant that is now available. A new and revolutionary Version 5 matrix LED chip is now used in the new DIF 100 V5 series of LED Pendants. Years of laboratory experiments conducted by Orphek has led to the development of the ultra efficient V5 multi-chip. Each and every LED in this LED matrix was carefully designed and tuned to provide the best light for coral color and extremely fast growth. Orphek’s major goal in this new LED multichip was to increase the lumens per watt in the lower spectrum range which appears darker to the human eye’s receptors. This lower spectrum range is also the range that chlorophyll A depends on to provide the necessary nutrients that corals need to survive and grow. Without chlorophyll A, corals cannot survive. How did we do this? By developing new wide spectrum LEDs in the 415-435nm range and 435-450nm range with higher lumens per watt. 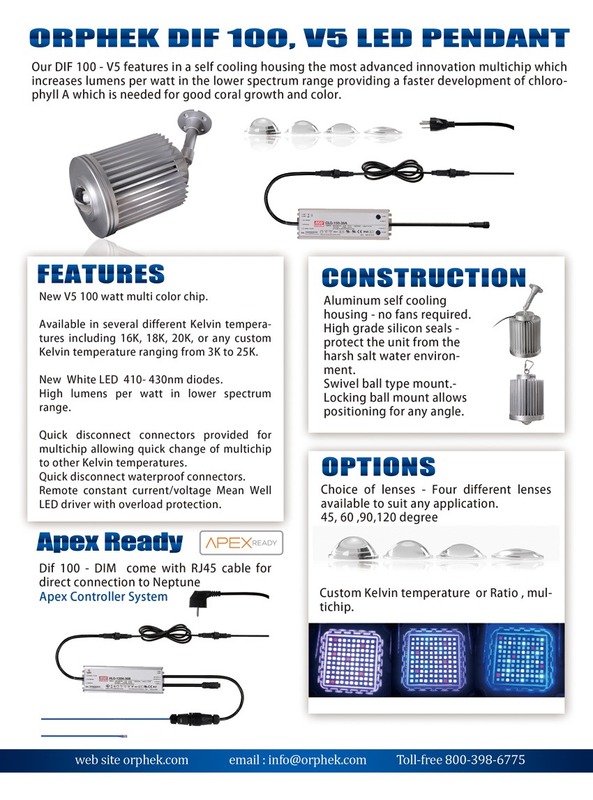 To further enhance the spectrum, we use 70 new LED chips in the 450-475nm range to produce a metal halide look of 18K. Five of our new wide spectrum blue LEDs are also used to help balance the color while not affecting a noticeable change in the spectrum. Our new wide range red LEDs are also used to refine the PUR spectrum and add color pop to the fishes and corals. A word about lumens; The lumen can be thought of as a measure of the total amount of visible light in a given area or light emitted from one source of light. The number of lumens a light source can emit depends on the spectrum the light is emitting. A word about spectrum; the visible spectrum is the portion of the electromagnetic spectrum that is visible to the human eye. A typical human eye will respond to wavelengths from approximately 390 to 700 nanometers. The human eye has its maximum sensitivity at around 555 nanometers which is the green region of the visible spectrum. This is one reason why some people feel other LEDs are better because of its apparent brightness, but the brightness occurs in the wrong spectral range. Orphek’s goal was to increase the Lumen per watt in the new white LED chip by 15 times which provides more than enough intensity in this spectrum range for chlorophyll A. Chlorophyll A is very important for corals to survive and grow. The spectrum in this range does not appear bright to the human eye and if too many blue LEDs are used in this range, the aquarium will appear dark. With Orphek’s new white LED chip, we have increased the intensity by up to 60 lumens per watt in the 410nm, 420nm, and 430nm range. The new Orphek LED matrix chip will also provide spectacular coloration of your corals with the increased intensity level in the lower spectrum. Common off the shelf UV/Violet diodes provide about .2 to 4 lumens per watt. This advanced innovation allows us to use more UV/Violet diodes to raise the intensity shown in the above spectrum without the downside of having a dull blue looking display while still providing the demanding light requirements needed for Chlorophyll A to flourish. The new and revolutionary Version 5 LED matrix chip will be available in several customized Kelvin temperatures; 16K, 18K, 20K, or any custom Kelvin temperature ranging from 3K to 25K. We also have a freshwater planted tank multichip for hobbyists with planted tank. Version 5 is another milestone in Orphek’s ongoing superior LED technology which continually offers improvements in the LED process and in the spectrum corals best respond to. Orphek can also provide a customized V5 LED matrix chip to meet any customer’s application needs. On request, Orphek will provide to each customer, a unique spectrograph of the V5 Version they have chose. Soon, Orphek will have spectrograph maps of our unique LED chips on our website. If you presently use a Neptune Apex Controller or other brand, Orphek can equip the DIF 100 V5 with a RJ45 cable that will plug directly into an Apex VDM lighting module which will allow full dimming capabilities as well as adjustable timed photoperiod. This option is available at a minimal cost of $15.00. Light weight and smaller body. Aluminum finned housing acts as a enormous heat sink. Reduces temperature of previous model by 15C. New matrix V5 multichip for improved intensity in for chlorophyll A. Quick disconnect waterproof connector on driver cable. Remotely located Mean Well high efficiency LED driver. Improved wide range red LEDs. Choice of lenses to suit any application. Orphek superior LED technology used throughout. Very high Lumens per watt. Suitable for very deep aquariums with appropriate lens. If you plan on attending MACNA 2013, make it a point to stop by our booth and see the new Orphek DIF100 V5. We will have five different chip versions we will be demonstrating with a PAR meter and our own spectrometer. We will also have on hand our new Atlantik V2 and PR72 V2 models doing similar demonstrations.